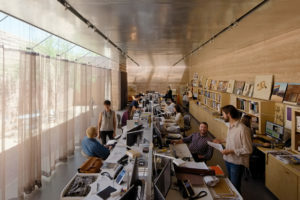 Since 1993, Rick Joy has led a cooperative practice engaged in architecture, planning, and interiors around the globe. Studio Rick Joy is based in Tucson. The core values that drive the work of the firm arise from a studio environment in which creativity and discovery thrive alongside expertise and experience. The built work of the studio is the result of the talent and energy of a diverse team and reflects concepts that arise from a practice of comprehensive observation and generosity of approach. Exactitude, details that support ideas, and a respect for the origins of craft give rise to design and materials that pay respect to one another and to the culture of a place. By being sensitive toward the world and cherishing each site's spirit, we produce architecture that lives well in its surroundings and that becomes a stage for daily life.